Today, I’m taking a side path on the wine adventure, to talk about another liquor that holds a very special place in my heart. Absinthe, the magical green liquid and gateway to the green fairy. I am an Absinthe aficionado. On my bar at home, there are many different kinds of Absinthe -- Spanish, French, Czech, Bulgarian, and German, just to name a few. There are some red in color, but most various shades of brilliant greens, recently I have added a couple of American makers into the collection as well. The spoons and stemware for serving Absinthe is just as diverse and numerous as the bottles and beautiful glass containers for storing the sugar cubes and in my house, have fought (and won) center display stage in my glass racks as functional art. So, then why am I talking about all of this today? Please join guest instructor Lance Winters, master distiller at Hangar One and maker of Absinthe Verte, as he shares the history of Absinthe—the ritual, the mystique and the legends. He’ll also tell the story behind getting government approval for his Absinthe Verte, the first US-made absinthe after almost 100 years of being banned. 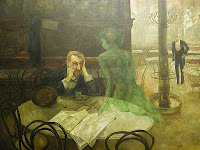 As the NY Times stated in an article about Absinthe Verte, "For years, absinthe’s chief appeal has been its shady reputation and contraband status. But people may be astonished by how delicate, gentle and refreshing some are." At this event, you'll learn about nuanced herbal flavors by tasting of three absinthes, including Lance's Absinthe Verte. You’ll also taste an absinthe cocktail as Lance discusses how absinthe was an integral part of cocktails a century ago. Since absinthe is 120 proof, we'll provide delicious absorbents in the form of french fries and bites of locally-made sausages as we sip. It’s $69 bucks, and that is a steal. Thanks for promoting this event. If you don't have plans Friday, I'd love for you to come as my guest. Let me know. Thank you for the invite! Unfortunatly I have a soccer match tonight - or else I would have been there! And I am always happy to help promote local events!